Heat oil in a pot. Once the oil is hot, sauté the finely ground ingredients with the curry powder paste, the chili paste and the turmeric until aromatic. Add in the prawns and the tuna flakes and stir-fry briefly on high heat. Pour in the tamarind pulp, water and coconut milk. Season with salt and sugar the laksa sauce to your taste. Let it reduce it until it becomes thick and then stop the cooking. 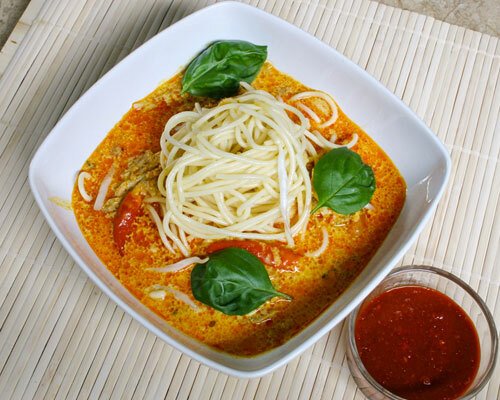 To serve our Laksa Johor, place the cooked spaghetti in a bowl and slowly pour the thick gravy on top. Garnish with some bean sprouts, onions, basil, cucumber. You can add on the side some sambal belacan and lime.